This litany is a modern canticle of desperation, the kind that seeking happiness and finding it not, excuses whatever the means and whatever the ends. Having bought this package of deceit, we will at some point find ourselves abandoned to our meager resources, and left to fend for ourselves on this path of self-perpetuating dissatisfaction. The story does not end here. If we are lucky and honest enough, we might chance on a counter proposal, one that sees even all this lost hope as ‘necessary,’ as the precise means through which the portal to hope emerges from the clouding mist of a thoroughly modern confusion and doubt. We should pray for this chance. I found myself wondering how much of this kind of telling is necessary, and realized that it all is. Such is the story of sin, confession and the human heart. Despite modern tales of self-sufficiency, there is a real human dependence, a real need to tell and to be heard in the telling. Facebook stands as a novel paradigm, somewhere between this human need and God, for it has the public dimension of telling a virtual ‘other’, and the ironic anonymity of telling no ‘one’. Amid all this virtual confessing, once in a rare while we come across a bold truth-telling that stops us in our tracks. On a purely human level, admitting one is wrong takes courage and an abundant dose of humility. Receiving the admission is a gift. No one finds it easy to admit to something altogether embarrassing or self-depreciating, but when it happens, what follows is the realization that there is a grace to the telling and a privilege in the listening. Transposed to the sacramental level, to tell and be heard beyond the confines of what is a limited human exchange is to tell and to be heard by God. This kind of frank admission of the reality of sin and our need for mercy is a grace-filled act. It stands apart from the litany of endless empty platitudes on happiness and opens the gateway to knowing that before we had the chance to realize our own sometimes desperate need, God gave us our freedom — freedom free enough to reject His love. The Incarnation is God’s confession of love. Through it, He tells the world all there is to say about His love and His mercy. He did it an understandable way, by taking on a form that is completely familiar, that of a man in Christ. This ‘coming to earth’ is not simply the descent of God. It is a confession from God, a telling us that we are infinitely loved. It is a radical and viscerally real admission, a manifestation that was for our sake all-necessary, all-generous, all-personal. Against this backdrop of abundance, each sacramental confession becomes an opportunity for a personal encounter between one much loved soul and Christ himself. In spite of our dependence, and our guilt, real as it is, He remains greater than our worst sin, more loving than all our love, merciful because He is all good. Perhaps we should desire confession, as a response of love for Love, the way He desired confessing his love for us. The question remains: what prevents our approach, our homecoming? An honest introspection, an examination of the truth, might perhaps lead us to make a similar confession. “‘What is wrong with the world? With my life?’ ‘I am.’” In this admission we would not only come to know all that is right with the world, but we would also be given the chance to make peace with the Truth. And should we actually enumerate our faults with courage and candor, we would experience the exchange where bringing our sin we receive His love. Then, as if born anew and out of the misery, we would see again with the docility of children. 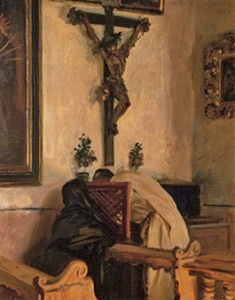 Looking upon the many real and aching wounds of our culture — the absence of love, the presence of evil, the loss of innocence, the irreverence for all that is good — from this vantage point of newly restored grace, we come to know at last the redemptive power of God’s confession of love; we see the difference it makes, and make it incarnate anew. It is time to stop pretending we are fine on our own, happier without God, freer because of ourselves. We do not need affirmation of our limitation; we need freedom from it. It is time to stop denying ourselves the mercy that abounds! Love is waiting. Comes down to misery on earth. It all began with God’s confession; the Incarnation continues with ours.